Well lots has happened since our last update. We spent a great last day in Rome at the Pantheon, Piazza Navona and the evening attending the ‘E’lisir de Amore’ at the Opera house. All three would make it onto my must-do list for Rome. The first two were free, the Opera was €59 for middle of the road tickets. The opera was an amazing experience, a gorgeous ornate opera house with the Italians dressed in their finest and spectacular singing…very ‘Pretty Woman’ 🙂 ! After Rome, we made our way to the Amalfi Coast. We stopped en route at Pompeii and were treated to beautiful, clear views of Mt. Vesuvius. Pompeii turned out to be very interesting and was much more extensive than I imagined. The state of the ruins and the extent to which they were preserved was incredible. From Pompeii, we took a road through the mountain pass on the Sorrento Peninsula to reach the Amalfi Coast. Mama Mia, what a road! Zigzagging higher and higher to the top of the mountain with the coast miles below over steep cliffs, our coach clinging to the side of the mountain on a single land road with traffic going in both directions! Yikes, it was a close your eyes and hang on kind of ride. If you want to reach Amalfi on your own, you can take a train to Sorrento or Salerno and then ferries from there to several of the villages. We stayed three nights in Maiori, the largest town in Amalfi Coast with 10,000 people. Our hotel was the Soleil Splendid and we had a large, lovely one bedroom suite overlooking the Mediterranean. It was very 1950’s style, but quaint, sparkling clean and with a nice breakfast each morning. We could always hear the sound of the waves from our room, I loved it! Maiori has a good bit of shopping with friendly shopkeepers, a beautiful promenade running the length of the sea. Some of our best meals were here at local seaside restaurants. The food seemed a bit more inventive or less plain than what we found in Rome… local pasta with pumpkin flowers and fresh smoked cheese, ravioli with romano infused with local lemon and cherry tomatoes, yum! Plus the best tomato soup I have ever had! This area is well known for their lemons, they are everywhere! Lemoncello, olive oil infused with lemon, etc. While in Amalfi we also visited Amalfi town, the oldest village in the area and the famous Isle of Capri! It was about 1.5 hours by ferry each way from Amalfi town to Capri. Once in Capri, you take a cable car from the harbour to the town built in the mountain above. The cable car takes five minutes and cost €1.80. The town is known to host the rich and famous, Tom Cruise, etc. There are some of the best views there, it is a really impressive island. There is a monastery with famous flower gardens and their own perfumery. There are top end hotels and villas owned by the rich and famous, as well as all the high end shopping, Gucci, Prada, Valentino and much more….every girl’s dream if you had an endless budget! We skipped the shopping, had a really nice lunch and went back to the harbour and spent an hour being lazy at the local free beach. It wasn’t quite swimming weather, but it was pleasant and relaxing to sit and look at the beautiful blue Mediterranean. Now we are off to Florence and Venice for two nights each, which is sure to be a whirlwind of sightseeing and trying to fit everything into our last few days. There is so much to see and do here, two weeks is not enough! Well we have now spent a full 48 hours in Rome and my head is spinning! There is so much here to see and do it will be impossible in the three and a half days we are here. Let me start by saying Rome is magnificent and exactly as I was hoping/expecting. Here are a few of my first-glance observations and tips. 1) Conversation for Italians is more of a competition than a conversation. Each speaking louder, faster and with more movement than the next to try to get their point across. At the same time it is a beautiful language and like a ballet of lyrical words constantly playing in the background. I have also noticed while Italians are eating, drinking, enjoying each others company – no one is on their phone for the entire meal! How refreshing! 2) Rome is a city meant to be walked. The metro is easy, only two lines, one to the Spanish Steps and onwards to the Vatican, the other to the Colosseum. However, we have walked everywhere. Our hotel is near the Termini train station, – it’s the Una hotel which is lovely and modern. From our hotel you can walk everywhere. The Trevi fountain, Spanish steps, Colosseum are all about 20 minutes. From there, a few more minutes and you are at the Piazza del Popollo, the Piazza Navona, the Pantheon and more. It seems easy to get lost, but then all the little side streets and alleys all lead back to one of the main roads and it’s easy to find your way again. Getting lost is half the fun as there is a new treasure around every corner. Churches that don’t make the tourist map or guidebook, but manage to take your breath away when you stumble into one…or gardens full of towering pines and cool breezes….or ancient ruins, walls and aqueducts. Rome really is full of hidden treasures waiting for you to come across them. 3) See the sights from the day and evening perspective if you can. Seeing the Trevi fountain and St. Peter’s lit up at night is beautiful and so different from the daytime. 4) Come prepared for people, noise, traffic and crowds. The first day and a half we wandered through some sights and the streets of Rome on our own. It was busy and at times it felt you took your life in your hands attempting to cross the street. Today we went to the Vatican and Colosseum on a guided tour and learned what crowds were really about! Thankfully with our guide we could skip the lines as we had reservations. The Vatican Museum, Sistine Chapel and St. Peters were really worth visiting, but the endless crush of people hurrying you along and pushing and shoving did manage to take away some of the enjoyment. It would have been nice to take your time and take it all in. 5) Bathrooms! As a pregnant lady, bathrooms are of utmost importance these days! There aren’t a lot of public ones and you often pay €1-1.5 to use them. My secret trick- McDonalds! There are signs everywhere pointing you to the next McDonalds and they almost always have decent facilities available. 6) Last but not least, come hungry! I have fallen in love with their mixed Brushetta plates and order one with every meal. The pasta and pizza are fresh and delicious and best of all the homemade ice cream (gelato) sold on every corner! Tomorrow we have more free time, so I think we will visit the Pantheon and Piazza Navona, plus we have tickets to the Opera! After that, it us on to the Amalfi Coast. I’m back from Alaska! 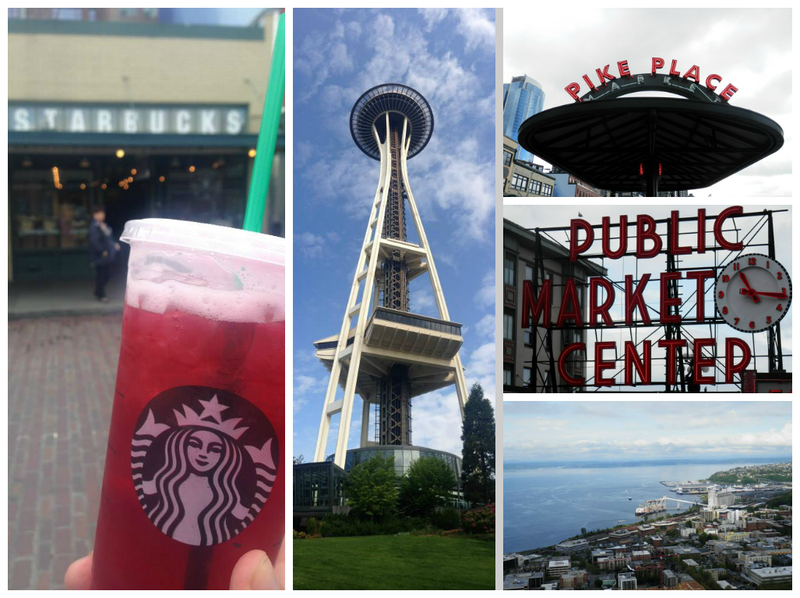 The cruise ended in Seattle, and adding the Seattle Essentials shore excursion through Carnival was a great way to end the cruise. The excursion cost $70 and the price included an airport transfer ($27 if booked separately) and a ticket for the Space Needle ($19 if booked separately) and lasted around 4 hours, so I found it to be a good price for the tour and what was included. Plus it would have been such a hassle to do it myself, trying to lug around my suitcase and carry on all morning. All luggage was put on the tour bus for the entire tour, and given back at the airport. To disembark from the ship, there are 2 options; put your luggage outside of your door by midnight the night before, or take it with you in the morning. My friend and I both put it outside our door with the tags they gave us. Everyone on the Seattle Essentials tour was given a tag with the number 4. In the morning, we all met in the theatre and everyone is called out for group number. Since we were number 4, we got off the ship pretty early (around 815am) and everyone who had put their luggage out the night before picked up their suitcase in the port, which was all separated by group number. Since this was my first cruise I was not sure how disembarking worked, and I was happy that it went so quickly and smoothly. The tour started around 830am and our first stop was the Space Needle. The Space Needle does not open until 930am so for the first hour, our tour bus driver drove us around Seattle, pointing out highlights (specifically the football and baseball stadiums, and the central business district where the Great Seattle Fire occurred in 1889) until we could get into the Space Needle. It was a bit overcast but definitely not a bad day, so it made the view from the top of the Space Needle really nice. We had about an hour at the Space Needle, then we headed to Pike Place Market, where we had a little over an hour. Pike Place Market was my favourite part of Seattle. I’m a big Starbucks fan, so I was really excited to see the first ever Starbucks location. Because it was pretty early still, it was not too busy (busier than a normal Starbucks, but considering it is a pretty big tourist attraction, not bad) which was nice. I didn’t actually shop at all, I was just so excited to walk around the area taking far too many photos. Another big tourist attraction is the Fish Market, where the workers throw the fish when one is purchased instead of handing it to each other. I was standing right behind a worker who threw the fish, and when it was thrown back I wanted to trust him to catch it, but when a fish is flying towards your face I think it’s pretty natural to be a little terrified. But obviously he caught it and I did not get hit in the face with a fish (you never know!) After Pike Place Market, the tour bus driver drove us around a bit more of Seattle before heading to the airport, which we got to around 12:15pm and is perfect for anyone with an afternoon flight. I actually managed to get a sunburn while in Alaska, and when I came home I could see my breath when I got off of the plane. That seems a bit backwards! It was a great trip, and definitely a good first cruise experience! I’m currently in Ketchikan, one of the rainiest cities in the world, and it’s sunny and gorgeous! I’m not sure what the weather is in Saskatoon right now but it’s +16 with just a bit of wind here, and I am loving it. We had a sailing day yesterday so my friend and I tanned on the sun deck all day and my face is bright red now. Who would have thought that I would get burnt in Alaska? We sailed through Glacier Bay yesterday and it was gorgeous. The view for the entire day was just perfect. It seemed so weird to be tanning while staring at huge glaciers, but I’m not complaining. Glacier Bay is a great place to see wildlife. Some passengers saw a bear, and we saw about 10 whales (well, we mostly saw the mist from their blowhole). One baby whale jumped about 30 feet from the ship, which was the best whale sighting so far. I’m off to explore more of Ketchikan! This is our last port before the cruise ends in Seattle. I’m flying home that afternoon but I booked a shore excursion through Carnival to see the main highlights of Seattle before my flight. It will be a long day, but it seems like a good way to end the trip! Hello from Juneau! I’m currently on an Alaskan cruise with Carnival and just spent the day in the first port. We left Vancouver a few days ago and spent the last two days sailing. It was pouring rain for our two sailing days with winds up to 72 miles per hour, and since this is the first cruise I’ve ever been on, I was a little nervous when I first felt the ship rocking a bit. No motion sickness so far though, so keep your fingers crossed for me that it stays that way! Luckily, the weather today in Juneau is AMAZING. My friend and I wore layers and our jackets and sweaters did not stay on long. We are on the first cruise of the season and so a lot of stores are just opening, and since we are the only cruise shipped docked today, it was not very busy. Which was especially nice for going up on the tram, because there was no wait time. I’m going to up again later tonight to see the sunset, which is supposed to be around 845pm and the last tram comes back down at 9pm. As much as I’d hate to see the sun go down because I love how hot it is today, I’m really excited to see the sunset from the top of a mountain! The Alaska Brewing Co. offers tours every hour for $15 and they last about an hour and a half. The tour itself was free so the price was more so for the ride to and from the brewing factory. We ran into a family who took a cab themselves and said that a cab was $20 each way, so unless you have 3+ people who would be sharing a cab, it is less expensive to take the tour offered at the Alaska Brewing Co. store downtown. The tour includes a sampling of 4 types of Alaskan beer, while learning about the history of how the company came to be, plus 2 more glasses of any beer they made. I just had a sip of each because I’m not much of a beer girl, but spending only $15 for 6 (decent sized) beers and a little history lesson is not a bad way to spend an hour and a half. After sailing from Kauai we had 5 days at sea to get to Ensenada Mexico,. We were invited to a cocktail reception with the captain and the officers. The captain’s name was Todd McBain and he was from Edmonton so we talked a bit about our Riders! That day and the following were sunny, warm and the seas were calm. The next 3 days were cloudy, cold and the seas were very rough. The waves were up to 14.5 feet. Lots of people were sea sick and the Noro Virus was up to almost 3%. We did spend a lot of time in our stateroom…not wanting to get sick and ordered room service a couple of the nights. Most of the television channels in our stateroom were controlled by Princess and they did play lots of new movies so that was good (too cold to watch the Movies Under the Stars) After the five sea days we arrived in Ensenada, Mexico….we were so close to be back in Los Angeles (about a 100 miles away) We took a tour up a mountain to see a blow hole. The driver said there are lots of them in Mexico but this is the one that is always active. The ride was about 45 minutes and the scenery was awesome. We walked through the market to the blow hole and took some pictures and video (if you needed to use the restroom you had to pay 50 cents USD) The market was really busy since it was Good Friday and Spring Break. We had a hour and a half so we decided to have lunch and a margarita and wait for everyone to buy their blankets, dolls and pottery. When we all got on the bus everyone showed what they purchased and said how much they paid….some of them were a lot better at bartering then some of the others. We were back on the shop by three…the sun was shining and Mama Mia was playing on the big screen on the pool deck…awesome last afternoon at sea. After we set sail, we went to the casino for a bit and I won a bit of money playing roulette! After that we went and settled up the account for the stateroom. Went back and started to pack. They had requested the bags be outside the door later in the evening. In the morning we got up, packed the rest of the stuff for our carry on and went to the departure lounge to wait our turn to get off the ship. We were there by 9 am and they didn’t call us until close to 11 am. We cleared US Customs and waited for Lisa and Veda to pick us up. We stopped for lunch in Long Beach…it is a really nice area…lots of flowers and trees. We went back to Beverly Hills and drove down Rodeo Drive again (still looking for Brad Pitt – but no luck!) so we went to Lisa and Veda house which is in the Venice area…again lots of flowers and palm trees….I love it here (especially when we heard it was still cold and snowing in Saskatoon) This morning we woke up to find the Easter Bunny had been here and there was a Easter egg hunt in the yard…so much fun. Checked out Ikea and just relaxed and visited for the rest of the day. Early bed tonight….Disneyland tomorrow! Disneyland was awesome! The park was really busy but the lines were not too long. We saw lots of characters and took lots of pictures. They only have fireworks on the weekend so that was disappointing, but we did stay for the World of Color show at California Adventure and it was really good. We were in the front row and got pretty wet. I would recommend purchasing a hopper pass so you can go back and forth to see the different parades and shows. The next day we went to Universal Studios. I loved it there. It was not too busy and no long line ups for any of the attractions. Krustyland was lots of fun. Bart, Lisa, Homer and Marge were there taking pictures and the games were made for younger kids….they all got a prize (the games cost $10 to play) We went on the Studio Tour and it was awesome! They took us though the studio buildings and through some of the sets they use for movies and tv shows. We went into a tunnel and put on 3D glasses to watch King Kong fight off the dinosaurs…it was so real that I screamed a couple times lol. We had lunch in the park and it was not too expensive although the drinks were…we had a beer and it was $9. Our few days in Los Angeles went quick. The weather was really nice and after the long winter we had it was nice to see green grass, flowers and especially palm trees. Flew home with United, the flight was on time and it was good to get home after three weeks away.